A Spanish judge has summoned Barcelona footballer Lionel Messi to appear in court on 17 September over tax fraud allegations. The 25-year-old Argentine, who has four times been named World Player of the Year, and his father are accused of defrauding the Spanish authorities of more than 4m euros (£3.4m). They both deny the allegations. The player and his father, Jorge, are accused of three times defrauding the Spanish state of taxes. The income related to his image rights included contracts with Banco Sabadell, Danone, Adidas, Pepsi-Cola, Proctor and Gamble and the Kuwait Food Company. If he is convicted, Messi could face up to six years in prison and a big fine, according to Spain's Efe news agency. He wrote on his Facebook page, after the allegations became known last week: "We have never committed any infringement. We have always fulfilled all our tax obligations." He was ranked 10th among Forbes' list of sports stars' incomes this month. The president of Barcelona FC, Sandro Rosell, has said the club has no doubt that the superstar is innocent of tax avoidance. Messi is due to play a prominent role in the Adidas World Cup marketing campaign. 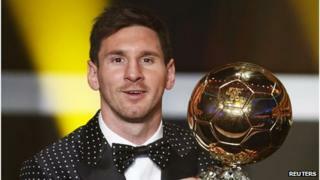 Adidas CEO Herbert Hainer told reporters that the company "will continue to work with Lionel. He's the best football player in the world and we are happy that we have him". But the allegations are a big blow to the prestige of Messi, who has long been seen as a more humble figure than most top-class footballers.